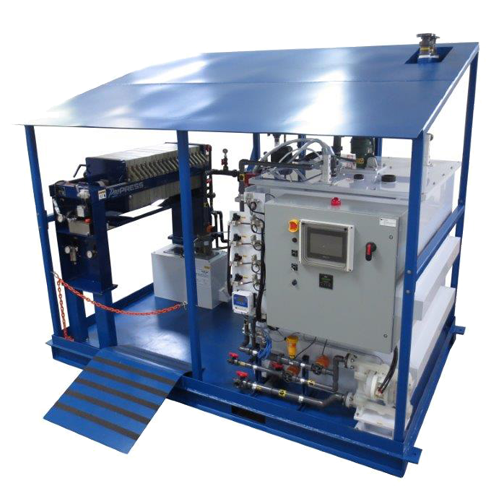 Wastech Controls & Engineering, Inc. has specialized in pre-packaged, skid-mounted pH adjustment systems, acid waste neutralization systems, pump lift stations, solvent pump lift stations, chemical/solvent collection cabinets and custom process skids for over 30 years. Safety, efficiency and service are embedded into every system Wastech delivers. No other process system integrator provides such a high level of engineering, quality, fabrication and post-sales service. With a large in-house staff of chemical, mechanical, electrical and controls engineers, Wastech Controls & Engineering, Inc. is the premier choice for world class process and industrial wastewater treatment equipment. Wastech Controls & Engineering, Inc. is a nationally recognized manufacturer of automated process equipment, specializing in pH adjustment, heavy metal removal (Zinc, Nickel, Chromium, etc. 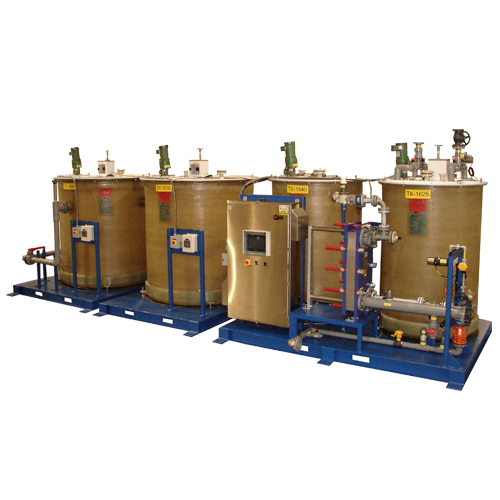 ), fluoride removal, pump lift stations, chemical collection, solvent collection, process chilled water, chemical dispense, custom process skids and control panel fabrication. Most systems are skid-mounted, pre-wired, pre-plumbed and factory-tested to minimize field installation work. Wastech also provides state of the art process automation and integration solutions, featuring control panels manufactured in its UL-certified panel shop. Wastech’s systems and services are guaranteed to perform to your complete satisfaction. ­­­Wastech services the Solar, Semiconductor, Pharmaceutical, Biotechnology, Chemical Processing, Medical Devices, Research & Development Laboratories, Food & Beverage, Aerospace, Power, Plating and Metal Finishing industries, with customers located throughout the United States and overseas. In addition to a wide range of standard products, Wastech can custom design systems tailored to your unique process needs. UL 508A & 698A panel shop using only UL-listed components. CSIA - certified control system integrator since 2004. Experienced fabricator familiar with welding and piping fabrication of stainless steel and all thermoplastics including PVC, CPVC, Polypropylene, PVDF and PFA. Fully staffed engineering department with chemical, mechanical, electrical and controls engineers to provide design and support for any industrial process or wastewater application. Allen Bradley/Rockwell Automation Solution Provider, with a proven track record and numerous satisfied clients worldwide. Engineer-managed field service support. Engineers are available for startup and commissioning, installation supervision, operator training, and emergency service calls. Monthly service contracts are also available. Client-oriented company where service is job number one. Large enough to design, build and deliver sophisticated process, wastewater and control systems, yet small enough to maintain a personal touch. By definition pH is the measure of free hydrogen activity in water. In more practical terms, pH is the measure of how acidic or basic a substance is. Measured on a scale of 0-14, solutions with a pH of less than 7 are considered acids while those with a pH of 7 or more are bases or alkaline. In any pH adjustment system, bases are used to neutralize acidic waste while acids are used to neutralize alkaline waste; the term caustic and base, although not truly synonymous, are often exchangeable. The byproducts are normally salts and water. 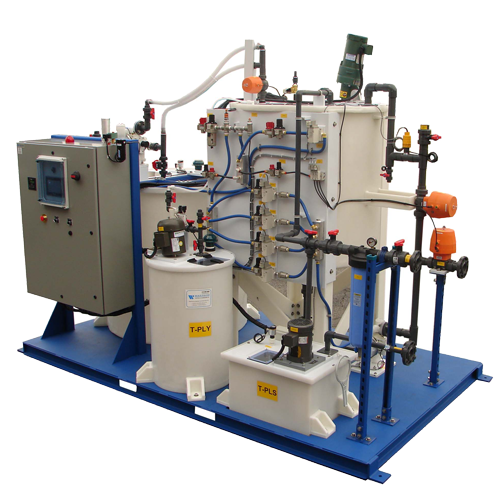 Wastech engineers and manufactures batch pH neutralization systems that treat intermittent flows of acidic or alkaline wastewater for industrial applications. These systems treat wastewater by adjusting the pH to a neutral range, typically between 6 and 9, before discharging the water to the public sewer. For large flows, Wastech designs continuous treatment systems that can provide pH adjustment using single stage, two stage, and three stage treatment systems. 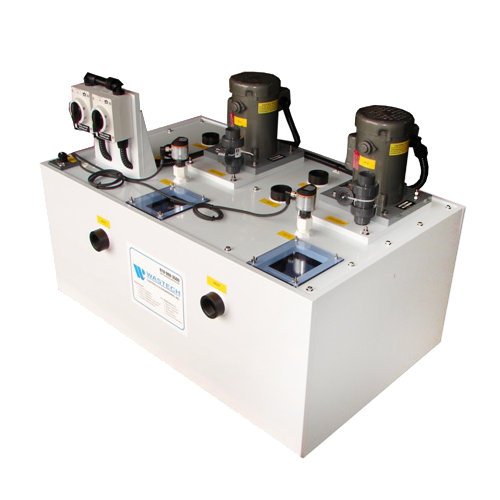 These series of pH neutralization systems can be skid mounted for ease of installation and customized depending on customer needs and space constraints. 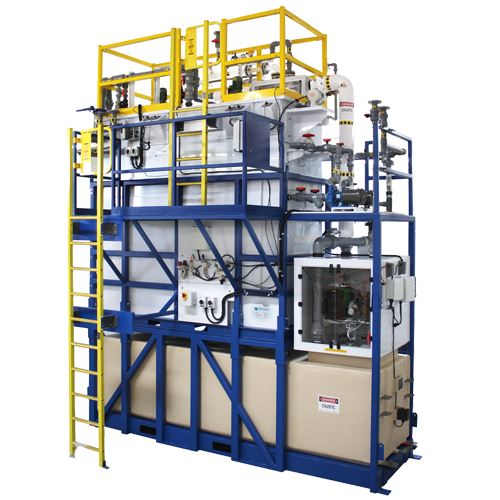 Wastech's Heavy Metal Removal System (HMR) is a fully automated, compact, skid mounted treatment system that removes dissolved metals from process wastewater before discharging to the sewer. Discharged metals in solution will be below discharge limits, and removed metals are bound up in a filter cake for disposal. Systems come with a UL-listed control panel and are controlled via PLC. The HMR system is capable of processing influent flows with a pH range from 1 to 13, and is available in continuous configurations, which are extremely effective in treating large flows of wastewater, typically higher than 15 gallons per minute, or batch configurations which are utilized for processing smaller volumes and capable of removing heavy metals from up to 2000 gallons per batch. Wastech's Fluoride Removal System (HF) is designed for removing fluorides from process wastewater. This fully-automated, skid-mounted system automatically precipitates and filters dissolved fluorides before discharging the treated wastewater to the sewer. Discharged fluorides in the resulting waste solution will be below required discharge limits. Removed fluorides are bound up in a dry cake for disposal. Complete HF Treatment systems are available in both laboratory and industrial configurations. During the wastewater treatment process, liquids can be transported from one area to another through a variety of means. Perhaps the easiest way to transfer liquids is through a gravity drain. However, there are occasions when gravity drains will not work or they are not practical. In these instances, pump lift station systems can move the wastewater from one area to another. Wastech Engineering offers a complete line of pump lift stations and UL-listed industrial control panels, enabling you to order an all-inclusive, pre-tested system. Wastech’s team of chemical, electrical, mechanical and controls engineers have the experience to automate your entire process, whether it be a simplex (one pump), duplex (two pump) or custom configuration. All pump lift stations include level switches which activate a high level alarm. Chemical Collection Cabinets from Wastech Controls and Engineering, Inc. are designed to store or collect hazardous, non-flammable chemical and liquid byproducts of a wide variety of industrial processes. These standard or custom cabinets house one (simplex) or two (duplex) 55-gallon polyethylene drums and come standard with state-or-the-art PLC packages and HMI screens capable of communicating with most building management systems. Pneumatically-operated switching valves are included for safe and reliable drum switching. 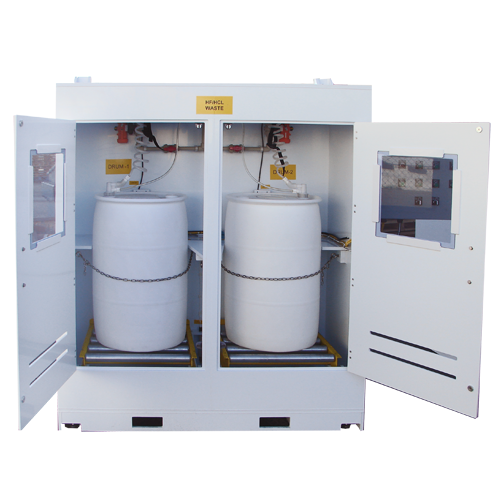 Wastech’s Solvent Collection Cabinets are similar in function and design, but are used specifically for the collection and storage of hazardous solvents, which are extremely volatile and challenging to handle. 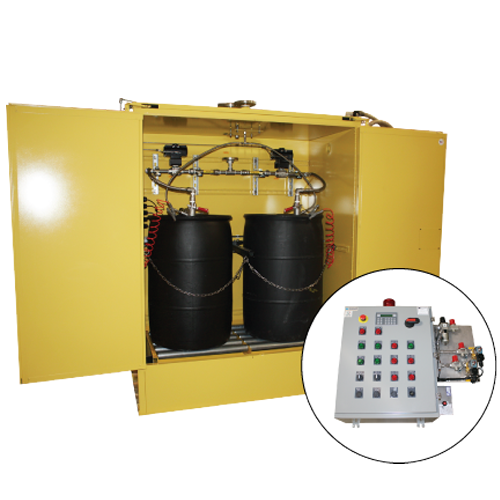 These cutting-edge solvent collection systems are Class 1, Div 1 rated for explosive environments and are in full compliance with NFPA Code 30 requirements. 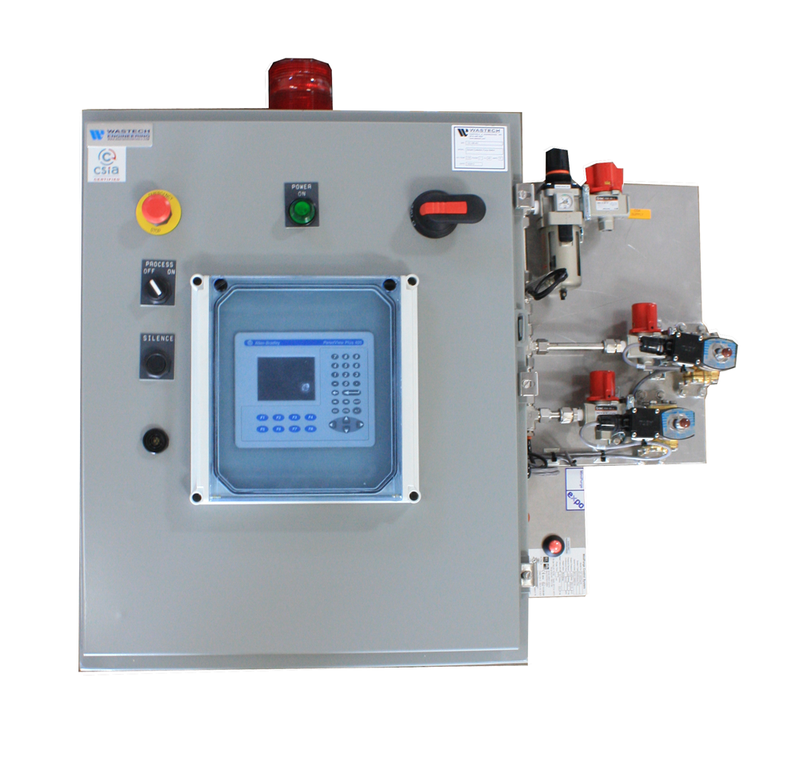 Liquid level within the single (simplex) or dual (duplex) stainless steel drums is displayed on a centralized control panel utilizing PLC-based control and optional HMI interface. All drums are housed in a fire-rated enclosure equipped with leak detection and monitoring sensors. In addition to a diverse offering of standard, pre-packaged industrial wastewater systems, Wastech also designs and fabricates a wide variety of custom process skids. With a full-time, in-house staff of chemical, mechanical, electrical and controls engineers, Wastech will assemble all the necessary information about your specific process, design a custom system with a complete set of drawings and specifications, then fabricate and deliver it right to your facility-pre-tested and ready for startup. 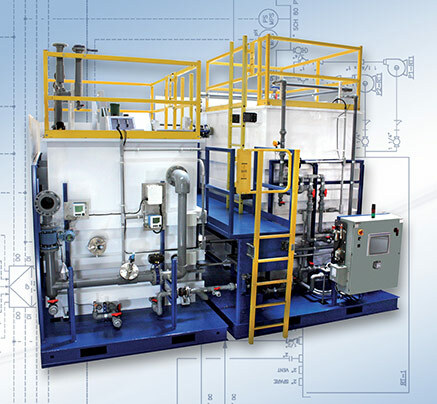 From Acid Dilution Systems to Heat Exchanger Skids, Sulfuric Acid Treatment to Filtration Skids, Wastech can design the most efficient system for your unique process.